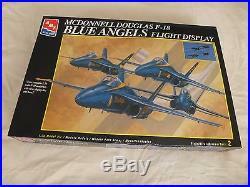 This listing is for the excellent AMT F-18 Blue Angels Flight Display model kit in 1:72 scale. Box is still in its shrink wrap but tightened from storage and crushed the box with some scuffing. You get 4 x F18 model kits sealed as new with a big stand which has a circular clear disk which the F18's are mounted. The item "AMT 172 F-18 Blue Angels Flight Display (4 Model kits)" is in sale since Monday, September 25, 2017. This item is in the category "Toys & Games\Model Kits\Models".